A dry wine should be dry and a sweet wine sweet. That sounds obvious. But considering the amounts of not-so-dry red wines sold in the world today, one begins to wonder. In the past, people enjoyed drinking sweet wines more: sherry, madeira, banyuls, maury, port, sauternes… Yes, they really liked sweet wines, that is, wines that are meant to be sweet. Even champagne was much, much sweeter than it is now. Today it is trendy to make Champagne as dry as possible. And German white wines that almost always used to have some or a lot of residual sugar are becoming drier and drier. Sauternes, port wines etc have to make an extra effort today to sell their wines. So one might think that dry wines are what consumers want nowadays. But, is it really so? I wonder. Because today the sweetness has sneaked into red wines. Where it does not belong (if it does not happen to be a recioto). In our opinion. Admittedly this applies mostly to simple red wines but these are the real bestseller wines. Not to mention Prosecco. This successful brand sells its “dry” and “extra dry” bubbles in enormous quantities (and some brut also, of course). Perhaps some consumers think that dry means, well, dry, but in bubble language, it actually means sweet (all sparkling wines in the EU have the same rules as Champagne to indicate sweetness). Perhaps this actually is clever marketing for the producers, offered for free by the EU rules? Consumers think they are drinking a dry wine, but in fact, it is rather sweet and thanks to its sweetness, the consumers like it more and they buy the same bottle again! But taste is of course very personal. So do not take this as a battle-cry, one of those that is heard once in a while, that “don’t buy [don’t make] these awful wines with high residual sugar”. There is no taste police (although one sometimes get that impression in some texts), no “acceptable” or correct taste, no one who has the right to say “you really should not like this wine”. The only correct and acceptable taste is your own, what you like. The autumn season for wine tours is in full swing. We, and our wine tour travel guests, have already been in Bordeaux, Loire, Alsace, Veneto and more. We are soon heading to Portugal, Rioja, more Bordeaux, Champagne, Puglia and some other places. You can follow us on BKWine Tours Facebook page. Take the opportunity to book your next wine tour with us now! We have just published the spring program plus some other things for 2019. More info below! PS: Recommend to your friends to read the Brief ! Many consumers perceive wines nowadays as more alcoholic than they used to be. This is actually quite true. This has to do with a lot of things (and not only global warming): grapes are harvested riper, wineries use better clones, consumers drink more wines from warmer climates, such as southern Italy, the New World, etc, which automatically gives a higher alcohol. On September 29, Scandinavia’s first Lambrusco festival will take place. It is Carlo Merolli in Denmark who wants to promote this bubbly, easy drinking wine from Emilia-Romagna. Carlo comes from Rome but has lived in Denmark for a long time. Through his wine shops, he has taught the Danes to drink good Italian wines. Climate change is a fact and the wine industry prepares in different ways for the future. INAO, the Institut national de l’origine et de la qualité, recently approved a change in the rules that allow the French appellations to plant other grape varieties than the ones that are now permitted in order to be able to experiment with grapes that are, for example, more resistant to heat and drought. In the current appellation regulations, there are two categories of grapes, main grapes and complementary grapes. Now a third category has been created, called “grapes for climate and environmental adaptation”. It is amazing how different vineyards look today compared to 30 years ago. Then, there was not one single straw of grass in the rows between the vines. Today vineyards are often vibrant and colourful with different plants and flowers to keep the vines company. But they also compete with the vines for water and nutrition, which can be good but also bad. Germany is a small but important wine country. 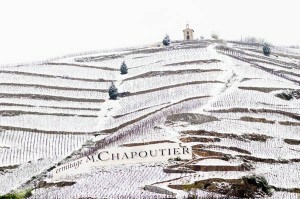 Steep slopes and a cool climate give us wines that are difficult to copy. The most planted grape is Riesling but nowadays one should also look out for Pinot blanc (Weissburgunder) and Pinot Gris (Grauburgunder). Both of these have increased their surface in recent years and are used to make some very good wines. Alsace wines are becoming drier and drier. At least that was the impression we had on our recent Alsace tour. And that is very positive. In addition, it is easier to know if the wines are dry or not because producers are now more and more putting “vin sec” on the label if the wine is dry. Or they use a dry-to-sweet scale to indicate the sweetness of the wine. This is useful to know when you are planning your dinner. Perhaps the most interesting “discovery” during the tour was the dry Pinot Gris wines. Only a few years ago, Pinot Gris from Alsace was almost always a sweet wine, often with as much as 20-30 grams of residual sugar. Now, many growers ferment out all the sugar and show us that the grape is amazingly good as totally dry. The wines are rich with a lovely mouthfeel. “These are texture wines”, says Melanie Pfister at Domaine Pfister in Dahlenheim. The nose is not as aromatic as a Riesling. It is a little restrained, but in the mouth, the wine opens and you feel honey, beeswax, tobacco. Sometimes it is even a little bit smoky. It’s truly a wine of character. Lots of new discoveries to be made. It has been a hot summer in France, but the growing conditions have not been easy everywhere. Alban Rabasa, assistant winemaker at Château Vaudieu in Châteauneuf-du-Pape, says that 2018 is une année du vigneron, which means that the wine maker’s skill may determine the quality of the wine. “With a lot of rain in the spring, mildiou attacks and some grey rot we will have to work hard in the cellar,” he says. Bernard Duseigneur at Domaine Duseigneur, who makes wine in Châteauneuf-du-Pape and in Lirac, also tells us about the huge amounts of rain they have had this year. “In 2017 we had 300 mm; in 2018 we have had 1700 mm!” But it looks good now. Already on September 6, when we visited Bernard, he told us about Syrah grapes that had already reached 14% potential alcohol strength. Bordeaux also had a rainy spring and early summer. “We have had enough rain to manage now for two years,” said Fabrice Bacquey, winemaker at Château Phélan Ségur in Saint-Estèphe. From mid-June, the heat and the sun appeared, but the moisture brought problems with mildiou and other fungal diseases. It was important to manage the diseases correctly and now that the harvest is underway – Phelan Ségur began to harvest on September 24 – the team is optimistic. “We have nice grapes, it will be a good vintage,” says Fabrice. This weather pattern was similar in many parts of France: a sunny and hot summer that promises good quality but sometimes problems with mildiou due to a wet April and May. Here’s the continuation of the video series with Alain Senderens, one of France’s all-time greatest chefs and creative food personalities. Throughout his career Senderens was a pioneer in French cuisine and especially for the pairing of food and wine. In these instalments he talks about his career, about life in the restaurant business and about people that were important throughout his life. You can also watch the previous segments on BKWine Magazine. About two years ago I was in Tuscany to harvest grapes. Syrah grapes. There is actually a fair amount of syrah planted in Tuscany. But this was a bit special. We were to harvest seven tons, which is about to one and a half or two hectares. 7000 kilograms, about 7000 bottles of wine to be made. But the project was also another kind of experiment. Does it matter if the wine ferments or is aged in an oak barrel or steel tank? What will the difference be if you use an amphora? Etcetera. We got six different bottles labelled with mysterious codes. All bottles were made from the syrah grapes we picked in Tuscany, but they had been treated differently in the winery. Was there any difference between the wines? Read the conclusions from this fun experiment in Per’s article on BKWine Magazine: Six secret wines show the importance of the winemaker. Read more of what Sven-Olof Johansson has two say about the Rhône wines and winemakers on BKWine Magazine: Wines to keep an eye on: Domaine de Marcoux. On our South America trip, there will be many wine tastings, both established and new ambitious wineries. Some of them may you may not have heard of. We always try to find the most interesting and exciting producers, go one step beyond the standard, beyond what others do. Some of them are not yet so famous, so you will be a pioneer in discovering tomorrow’s star producers. We start the journey in Buenos Aires, this lively metropolis where Europe and the Americas blend in an exciting mix and we finish it in Santiago de Chile, on the other side of the Andes. We travel for two weeks and we experience amazing scenery, amazing people and, not least, amazing food and wine. South Africa is a spectacular country to visit: dramatic mountains and rocky shores, wildlife with a stunning wealth and variety of species. South African has its own gastronomy that offers you many exciting surprises. And the quality of the wines has never been better than today. Small, ambitious wineries as well as larger wine producers focus on quality. But it is above all the smaller producers that lead the quality revolution, but that have a hard time making their voice heard internationally above the bulk wine noise. We will take you to meet some of the best of these dynamic producers during our trip that takes place in the beautiful summer month of February. You will have a chance of personally meet some of the top winemaker on this extraordinary tour. The grapes are getting ripe and the harvest is not far away. Book your wine tour to South Africa now! South Africa, February 16-24, February 2019. Bordeaux is a classic wine district that is a must on a wine lovers’ travel bucket list. On our wine tour to Bordeaux, you will get to know both small family chateaux and big, world-famous prestigious chateaux. Our lunches, that we have at some of the chateaux we visit, are unforgettable. We will take you to some luxurious Grand Cru Classé chateaux and taste several vintages of their wines. But you will also see other sides of Bordeaux, for instance how a small family estate works the vineyard organically, a huge trend today. You will learn about the latest developments in Bordeaux and how to pair Bordeaux wines with the local food. Join us for a great experience in Bordeaux. Our wine tour to New Zealand will be an adventure! We travel from Auckland on the North Island down to Queenstown on the South Island. We will visit the well-known wine regions of Hawke’s Bay, Martinborough, Marlborough, Central Otago and some more. We mix wine tasting with breath-taking scenery, traditional culture and, of course, the local cuisine. New Zealand may be best known for its Sauvignon Blanc wines but more and more other grapes are showing us what they can do here. And it’s impressive. The Pinot Noir wines (for example from trendy Central Otago) can compete with many Burgundy wines and Cabernet Sauvignon and Syrah has long been planted – and thriving – in certain areas. We will have the opportunity to explore all this during the trip. We are going to New Zealand in March and November 2019. The March trip is already fully booked but there are still spaces for November. In November, summer is approaching; the weather is mild and flowers are in bloom. Book your wine tour to New Zealand now, a very special experience! New Zealand, November 20 – December 5, 2019.